Paul Chambers, bass; Alan Dawson, drums. I once wrote that Sonny Criss seemed to be influenced by Charlie Parker in the specific period Bird spent in California in 1946, especially his appearances with JATP. I'm sure he was, but he had heard Parker long before on the records Bird made with Jay McShann. Sonny's mother had these Deccas in her record collection. Wherever the inception of the influence, it was there, in the playing of countless others in the '40s. But, even then, when closeness to Bird was considered the highest achievement, Sonny was clearly his own man. His sound was more "legitimate," perhaps a reflection of his liking for Benny Carter, and the way he played the Bird-like figurations was marked by personal turns of phrase. However, then he was in his teens. The fire and the swing were there but many of the edges were rough. Sometimes the "time" was unsteady. 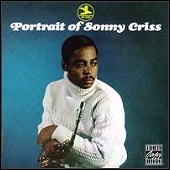 Now we hear a Sonny Criss who is a complete saxophone artist. He has established that familiarity with his instrument that makes playing as natural as breathing. He is the thorough professional but far from the bored one. The intense passion and drive are still there--in depth. You can hear the sincerity in the sound; the conviction in every note. To hear and feel love and warmth in a period where there are people who disclaim the validity of a painting of a flower, is a welcome experience. Criss's colleagues give him support of a most sympathetic nature. Walter Davis is an ebullient personality; a pianist out of the Bud Powell school whose style sometimes coincides with Kenny Drew's. He has worked with Max Roach, Dizzy Gillespie, Art Blakey and Jackie McLean. His talents extend past the piano to composing--and tailoring. Paul Chambers, mainstay of the famed Miles Davis quintet of the '50s, left the Wes Montgomery--Wynton Kelly group in 1966 to live and work in New York. He is one of the strong bassists with an ear for the right accompaniment. Alan Dawson, who lives, plays and teaches in Boston, has it all covered from down home to avant garde. And he never lets his ego get in the way of his excellence. The selections in this album are standards, old and new, a show tune, and two blues. The material is fine but it is what Sonny does with it that makes the album. First he fills the "Black Coffee" cup with a liquid that has had time to brew. This is no instant coffee. "Days Of Wine And Roses" [mp3] is swing with an intensity that adds a new dimension to the melody. Hot wine and singed roses. "When Sunny Gets Blue" is "sung" with a lilt and is a good example of Sonny's statement: "I never play a ballad unless I know the lyrics. It's just as important to me as the changes." That's side one. Side two opens with a shuffle blues by Walter Davis called "Greasy." Jackie McLean recorded it previously. It's short, simple and funky but Sonny doesn't need 50 choruses to make his point. "Sunrise, Sunset" is the music played during the wedding scene in Fiddler On The Roof when the first of Tevya's daughters is married. Criss invests the song with a tenderness and sensitivity all his own. He follows with his composition, the fast, minor-key "Steve's Blues," written for his own son, serving in Vietnam. The closer is the lovely, wistful "Skylark," a bird with strong wings, too. 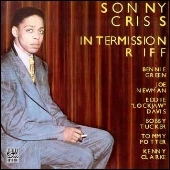 The actual, physical act of playing by Sonny Criss does not need detailed description. The quartet format is clasic; the songs are not confusing. Sonny just plays but how he plays. After the record date, he returned to California but this record should take him everywhere.